As implied in my post yesterday on the Torpedo 15a, I don't get the chance to "play" with "new" typewriters very often these days. By "new", of course, I mean particular typewriters that are "new" to me. 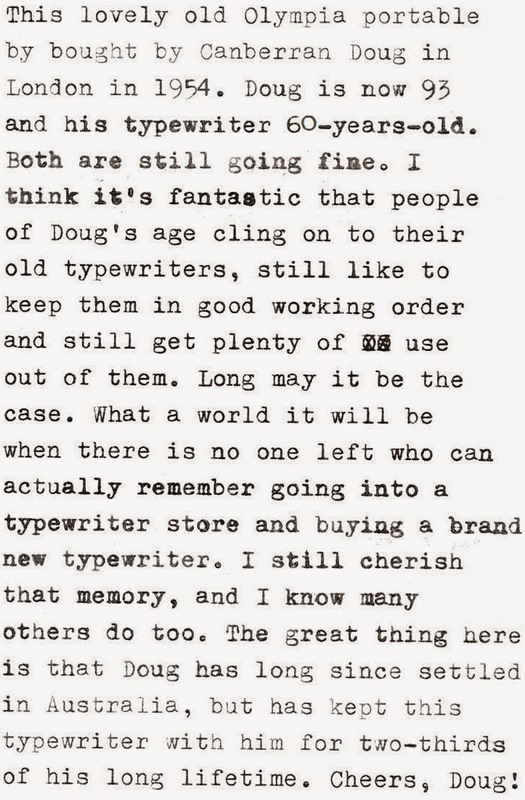 As I am no longer buying any typewriters for myself, the ones I do get to "play" with more often than not belong to someone else, and have been brought over here to be serviced. Just such a portable is this lovely grey Olympia SM2. A Canberra gentleman called Doug, who turns 94 next March 19, bought the Olympia just before he left England to return to Australia on the Orient Line in March 1954, after three years' service with the Royal Air Force. If I could read the little shield decal on the front of the Olympia, I might know which store Doug bought it in, but he says it was definitely in London. And it was distributed by Olympia Business Machines Co Ltd of 71 New Oxford Street WC1. This became "Brunsviga Olympia" in 1956. *PS: Thanks to Nick Bodemer's sleuthing, we can now positively identify this shield as the trademark of typewriter dealers Thrale & Beaumont, Central House, Kingsway, London WC. Here is a clearer image of the decal, taken from photos of an old Underwood standard for sale on eBay in Italy. *"My wife owns an electric," said Doug, "but I refuse to touch the thing!" 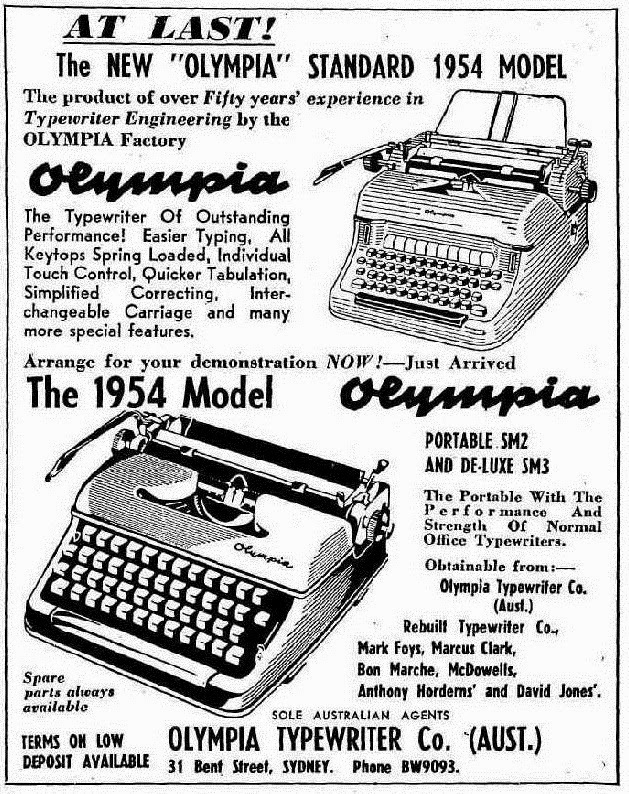 I'm glad Doug, when he picked up his Olympia this morning, cleared up for me when he bought it, as I thought he'd told me 1953, and a check of the serial number, 669919 (which is also on the carriage), indicated this typewriter was made after 1953. In fact, the serial number database would suggest 1955, but Doug is adamant it was bought in 1954, close to his 33rd birthday, and I can say with total confidence that his mind is as sharp as a tack. 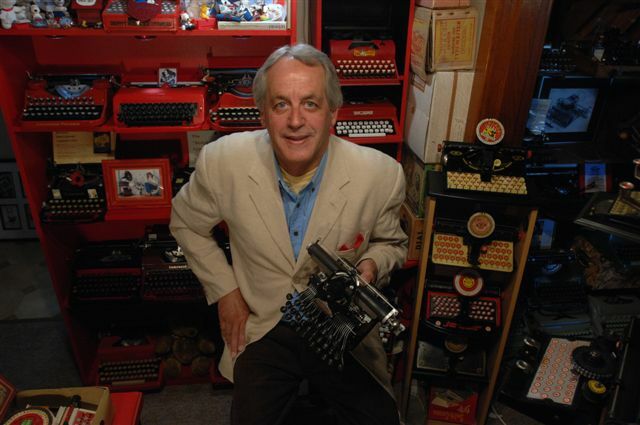 I advised Doug than when his typewriter is put in storage, he should pull the platen release knob forward. "No need," retorted Doug. "I intent to keep typing with it, not put it in storage!" Thanks Nick. 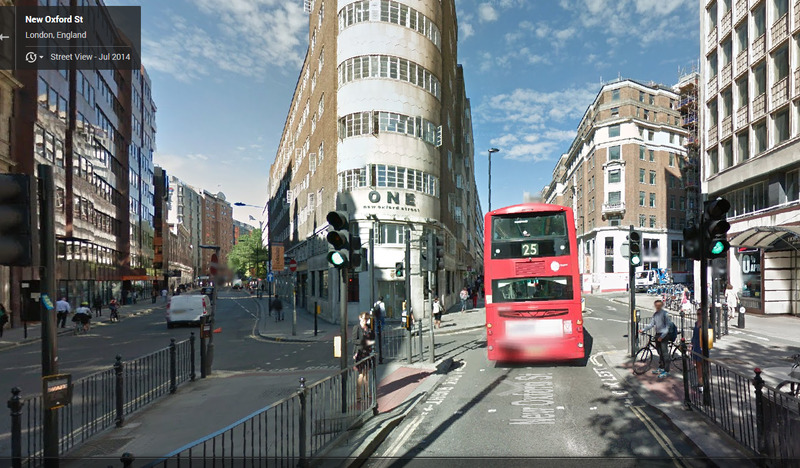 A web search reveals typewriter dealers Thrale & Beaumont, Central House, Kingsway, London WC. I have added a clearer image of the shield, but an old Underwood for sale on eBay in Italy. Nice when the typewriters come with the decal of where they were bought. A fine typewriter and a nice example of how a typewriter is a lifetime companion. Could it be an SM3, though? Richard, I may well be confused between SM2 and SM3. I used other online images, but especially advertising from the period and Dingwerth to identify. It seemed to me there are two versions of the SM2, one (1950, Dingwerth) with slightly raised areas on the spools cover above the spools, where the flaps were in earlier models, the other (1952, Dingwerth) with a smooth top. As well, it seemed the SM3 (1952, Dingwerth) was the DeLuxe version of this latter (1952) SM2, with the word DeLuxe on the segment. Can you please enlighten me? The 1954 Australian advert seems to me to support this? PS: What's also confusing is that ads for the "new model SM2" of 1952 has the name badge on the paper plate, not the spools cover, but Dingwerth has the later SM2 with the name badge on the spools cover. PPS: The main distinguishing feature, of course, is tabulation, which this one doesn't have.